Toronto Windshield Repair, Windshield Replacement, Auto Glass Services in the Toronto Area. 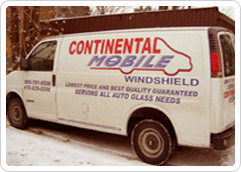 At Continental Mobile Windshield we install only the best quality auto glasses in the industry. Since our customers' safety is our priority, all auto glasses installed in your vehicle must meet all specifications set forth by the government and your automobile manufacturer. In many areas, we can service your vehicle within 24 hours. Modern windshields are made of laminated safety glass that consists of two layers of glass sandwiched around a layer of polyvinyl butyrate (PBV). When damaged, sharp pieces of glass tend to adhere to the PVB layer thereby reducing the danger to vehicle occupants from flying glass. The PVB layer in laminated glass also exerts a cushioning effect to protect and keep occupants inside the vehicle during collisions. Tempered or heat strengthened glass, is also considered safety glass. Tempered glass is often used in vehicle side and back windows. When broken, tempered glass crumbles into rounded glass pebbles. Laminated safety glass can normally be repaired, tempered glass cannot. Windshields have evolved into complex, engineered glass systems with features such as: heating elements to melt ice, coatings to repel ultra-violet radiation, shade bands, radio and telephone antennas, satellite uplinks, sensors to activate windshield wipers or close convertible tops. The cost of the modern windshield has steadily increased performance expectations. 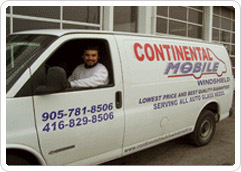 Copyright - 2011 – 2019 Continental Mobile Windshield Repair & Replacement - Toronto.